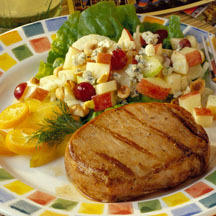 Enjoy the taste of the Pacific coast with these California-inspired, orange, garlic and cumin marinated chops. Place chops in a large self-sealing plastic bag; combine remaining ingredients in a small bowl and pour over chops. Seal bag and refrigerate for 4 to 24 hours. Remove chops from marinade (discarding marinade) and grill over medium-hot coals for a total of 12 to 15 minutes, turning to brown evenly. Serve chops immediately. Nutritional Information Per Serving (1/4 of recipe): Calories 280 calories Protein 39 grams Fat 12 grams Sodium 75 milligrams Cholesterol 105 milligrams Saturated Fat 3 grams Carbohydrates 4 grams.